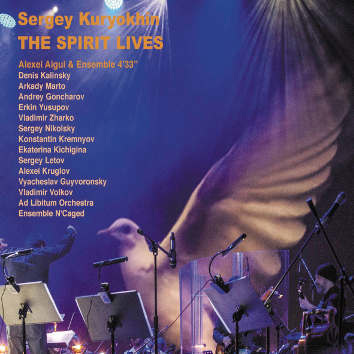 Music by Sergey Kuryokhin and Alexei Aigui in different sections arranged, directed and led by violinist Alexei Aigui and performed by his Ensemble 4’33” – named after the silent piece by John Cage. A second ensemble and an orchestra are also in here! This is an enormously variable work with roots in jazz, rock and much contemporary ‘classical’ – Monk and Taylor for example, mixing it perchance with Bartok, Cage and Scriabin. Throughout the concert there is an enormous tonal palette of considerable depth, due to spectacular orchestrations by Aigui and crystal clear rhythm and phrasing. The audience is truly appreciative of this performance and their timing too is excellent and brings alive the spirit of the tribute to an extraordinary musician. Kuryokhin’s live performances were known often to be delivered with a certain level of madness and this is echoed here in some of Aigui’s arrangements and their performances. Tracks 6 and 9, Mystic and Requiem both illustrate and resonate with the style of lunacy that Kuryokhin might have employed, but across all is a profound sense of unrestrained improvisation. There is a distinct sense of novelty to this album, a freshness which brings with it a sense of humour, yet the musicality is never veiled, never diminished.